There are several good reasons to buy homeowners insurance. For most people, your home may be the most valuable asset you own. For that reason, homeowners insurance may be the next most important investment you make. Policies vary; therefore, it helps to know for what coverage you are paying. Basic homeowners insurance policies insure a home and its contents from the risk of being damaged or destroyed by fire, theft, or wind from severe thunderstorms, tornadoes and hurricanes. Many people find that they don’t have enough insurance when a loss occurs because they buy coverage based on the size of the structure. Some homeowners do not consider the value of all the personal possessions contained inside the home. The findings of a 2002 study conducted by Marshall & Swift/Boeckh, a construction data firm based in Wisconsin, show that as many as 75 percent of homeowners in the United States do not carry adequate homeowners insurance to replace their home and the contents should a catastrophic loss occur. 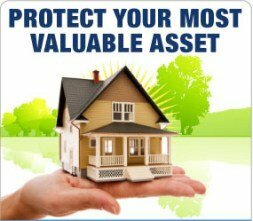 However, many insurance companies offer extended replacement value insurance. These policies are designed to cover up to 100 percent of the value of the home, while adding on a certain percentage to cover the cost of rebuilding the home based on current market pricing. In addition to protecting the structure and contents of your home, homeowners insurance also protects you against lawsuits if someone gets injured while on your property or in your home. You can purchase additional liability coverage if you have more assets to protect. According to Bankrate.com, while most homeowners policies provide for a limited liability limit of $100,000, you can purchase additional protection at relatively low cost. Liability coverage pays for bodily injury or damages you or another member of your household causes to someone else’s property. In addition to paying the injured party’s medical bills and for damages to property, liability protection covers the cost of hiring an attorney to defend you if someone sues you. Even if the state in which you reside does not require that you have homeowners insurance, in all likelihood, your lender will require that you carry insurance on the property. Homeowners insurance protects the lender’s investment from loss or damage caused by fire, vandalism or certain weather-related incidents. Lenders generally require that borrowers have a homeowners policy in place that provides at least enough coverage to insure the amount of the mortgage. If you fail to keep your home insured, the lender will purchase homeowners insurance and charge you. If your home is located in a flood or earthquake zone, a standard homeowners policy will not cover damage to or loss of your home in the event that this type of natural disaster occurs. Even so, you can purchase flood insurance or supplemental earthquake coverage from private insurance companies. You can also buy flood insurance by contacting the National Flood Insurance Program. These policies provide extra coverage and are separate from your standard homeowners insurance policy. If you live in an older home, most basic homeowners policies will not cover damage caused by sewer or drain backup. But you can usually purchase supplemental coverage to insure against these types of mishaps.